Unrivaled portable seating comfort and distinctive designs give your premium patrons the seating experience they deserve. More and more venues choose from Clarin by Hussey Seating’s selection of Premium Series folding chairs to create a memorable seating experience for their best customers. Venues find they can increase revenues by integrating Premium Series portable folding chairs into their seating mix. Among the Premium Series chairs, the Club offers a slimmer profile without sacrificing style or comfort. A distinctive back design with front and back upholstery gives the Club chair a regal look, while the contour foam and ultraflex suspension uplift seat provide the ultimate in comfort. Front and rear leg covers available. A 1 ½” (38 mm) wider seat gives guests more personal space. 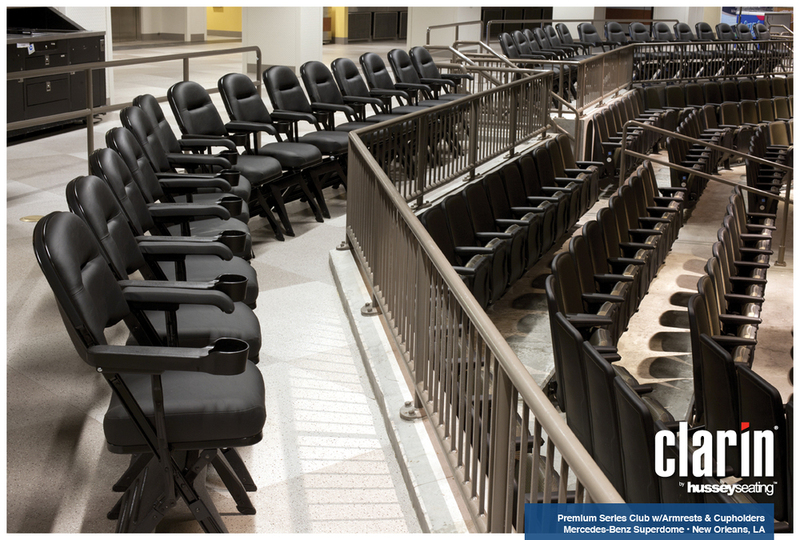 Clarin Premium Series Club folding chairs used as ADA seating. Features: one upholstered waterfall arm and one upholstered cup holder arm, black channel trim, contour uplift seat with ultraflex webbing, front and back leg covers. Clarin Premium Series Club folding chairs used in the University of Dayton Admissions Office. Features: black channel trim, extra wide contour uplift seat with ultraflex webbing for comfort, 1" (25 mm) ganging for one-arm chairs, waterfall upholstered arms, embroidered logo. Clarin Premium Series Club folding chairs used as locker room seating. Features: upholstered waterfall arms, black channel trim, extra wide contour uplift seat with ultraflex webbing for comfort, printed seat and back logos. Premium Series Club with upholstered waterfall arms and embroidered logo.